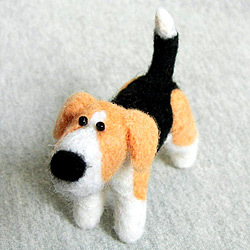 Today we are going to make a Cartoon Needle Felted Dog. My beagle might have a cartoon character looks and maybe he is not that realistic looking, but he is the easiest to make. 3. felting needles #38 and #40. We are using #38 during the whole process of felting and finishing our work with #40. 6. A sketch of your project. I usually draw my dogs in the size I am going to felt to make sure I am doing the correct size. Step 1: Make a rough shape of your dog's body and head from your wool batt. It should be slightly smaller than desired size of your finished project. Poke through the wool evenly with the #38 needle until firm, adding additional wool batt if needed. Step 2: According to your sketch make 4 white feet, 2 tan ears and black and white tail from your wool roving. Don't forget to leave the base of each detail un-felted to felt it later to the body. Step 3: Connect all the body parts together. Felt feet to the body. Apply a medium layer of white wool all over the dog's body. Step 4: Attach the ears with your felting needle. Add some tan wool where needed. Step 5: Attach the tail and apply some black roving wool to finish the project. Step 6: Make the nose by attaching a small amount of black wool with your # 40 needle, and glue your black beads for the dog's eyes. Our dog is ready! Well, he looks a little sad doesn't he? Let's take some red wool roving and make a ball for him! I just love this beagle, so cute! Such a cute and amazing toy! Thanks for sharing! So cute! Thank you for sharing the tutorial! I think that dog is way past my skill set. I love felted stuff, but I'm still so nervous to try. That dog is so cute! So cute, I love him. What kind of wool roving do you use? Is it corriedale?